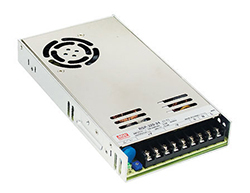 MEAN WELL RSP Series power supplies are low-profile AC/DC enclosed switching power supplies ideal for energy saving, low noise and limited space applications. The 75W to 200W feature an ultra-low profile of 30mm and up to 90% efficiency rate with free air convection cooling. The 320W to 2000W feature a 1U low-profile, with built-in fan. Power factor can be defined as the ratio of the real power flowing to the load to the apparent power in the circuit. Unfortunately, if the power factor is less than one, that means the current and voltage are not in phase, which can lead to many problems in electronic designs. Negative power factor occurs as a result of a load that generates power and acts as a source which flows back towards the main source. There are common symptoms to determine if a system needs power factor correction such as motor failures, electronic equipment failures, overheating, or unstable operation. Low power factor also draws more current which increases energy lost in the distribution system. This contributes to larger wires and expensive equipment in conjunction with the low power factor which drives up the cost for industrial or commercial customers. Depending on the load type, if a circuit has a linear load has a low power factor, it could be corrected with capacitors or inductors. In the case of non-linear loads, passive or active power factor correction can be used to raise the power factor as well as counteract the current distortion. Active PFC uses power electronics to change the waveform of the current drawn by a load to improve the power factor. There are a variety of active PFC circuits, but a boost converter inserted between a bridge rectifier and the main input capacitors is the common practice used in a switched-mode power supply. Based on the block diagram (Figure 1), we see that once regulated DC voltage comes from the power switching, it goes through a bridge rectifier, boost converter, and then a filter. The boost converter tries to maintain a constant DC voltage at the output, while drawing a current that has the same frequency and is in phase with the line voltage. It is then fed back into a detection circuit which determines the power quality to see if PFC is needed. One of the easiest methods of passive PFC is to use a filter that passes current at 50 or 60 Hz, known as the line frequency, in order to control harmonic current. The purpose is to make the non-linear device similar to a linear load by designing a filter consisting of capacitors or inductors. 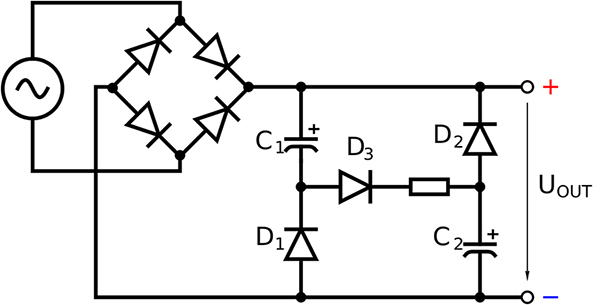 A valley-fill circuit (Figure 2) is an example of passive PFC that can be used. Once AC voltage is applied to the circuit, the rectified line voltage is applied across C1 and C2 and charges both capacitors. As they are both charged via D3 and the resistor, C1 and C2 are each charged up to approximately half of the peak line voltage. If the line voltage falls into the "valley" phase, Vout falls toward half of the peak line voltage. At this point, both capacitors begin to discharge into the load at Vout, due to D1 and D2 respectively. A resistor is needed to protect against electromagnetic interference (EMI) and a large in-rush current. There are many benefits to PFC based off the complications that can arise without PFC as explained earlier. PFC helps lower generation and transmission costs for distribution systems, utility bills for consumers, and mean time between failures for components used in power systems such as motors. The technical benefits include a reduction in voltage drops, harmonic distortions, and kVA demands which is a huge benefit in any industry that has not utilized power supplies with PFC. This ultimately, improves power quality and lowers cost which is extremely beneficial to any company, especially in engineering designs.